Thoth and my journey so far! Over the last few weeks I’ve fallen pretty hard down the Thoth rabbit hole. I never saw this coming, ever! In fact, several years ago when I was still getting my footing with tarot I picked up the Crowley Thoth deck out of curiosity and like many other tarot readers, I joined the group of those that felt Thoth was way too harsh and negative. I mean, just reading the some of the keywords on each card was enough to put a dent in your day. I really didn’t give it a chance and traded my Thoth deck after just one card pull, yup. It’s now several years later and Thoth peeked my curiosity once again, but this time something really grabbed my attention… that lure of symbolism and yearning for something more in tarot. A couple weeks ago I traded decks with a friend and got the Asherah Tarot. I’ve been longing for this deck for a while now and when she mentioned swapping, I jumped on it! When it arrived, I just couldn’t get over the illustrations on these cards… they are so detailed and so beautifully done. You can truly see the time and care it took in creating this deck. The Asherah Tarot was created by Sarah Wheatley and I will have a full review of this deck soon! I knew the Asherah Tarot was a Thoth based deck and I knew that this meant that I needed to get to know it and the system it follows if I wanted to get the most use out of it… plus, I always love an excuse to study something new! This was kind of how the rabbit hole started… with that Asherah Tarot, and I didn’t think I would dip too far into the Thoth world. After a few days with the Asherah Tarot, I decided to pick up my first book on Thoth to get more comfortable with the symbolism and see what the hell this deck was really all about. I took a trip to a local used/new bookstore and picked up a copy of Understanding Aleister Crowley’s Thoth Tarot by Lon Milo DuQuette. I’m about halfway finished with this book and loving every word written, it’s fantastic! Of course I couldn’t just grab one thing at the bookstore that day, I decided to grab the Crowley Thoth Tarot deck since I saw a used copy for a cheap price (in the car I discovered that it was nearly brand new). 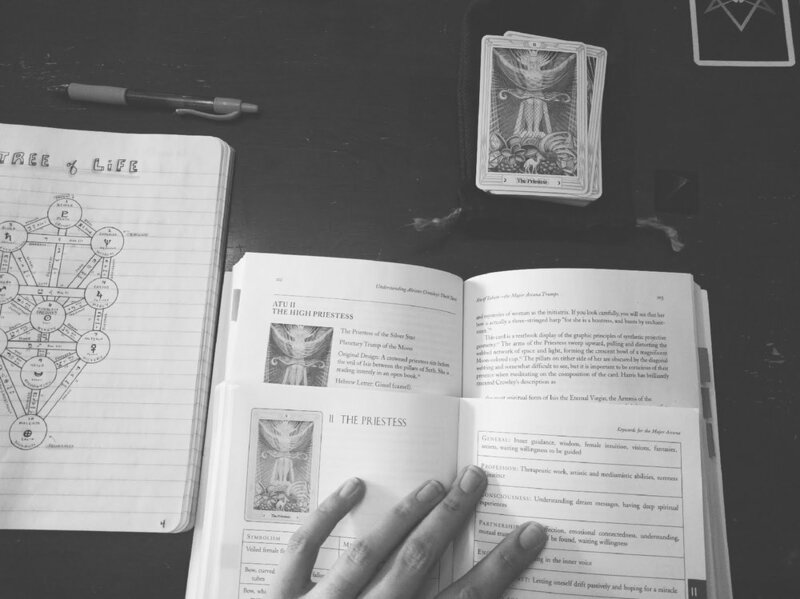 I thought it would be useful to use the Crowley Thoth deck alongside the Asherah to make for a good study, I would be able to have the full colored card images in person rather than just go off the black & white images in the book or online. I was already pretty far down the rabbit hole at this point and looking through the Crowley Thoth deck didn’t help at all, I was seeing these cards in a much different way than I had several years ago…. I was captivated! I’ve always loved the artwork in the Thoth Tarot, I’ve seen and heard many complain that it’s ugly but I’ve always found them to be beautiful and well executed! I had no idea the Crowley deck was painted by a woman by the name of Lady Frieda Harris, not sure why I never noticed that before but it stuck with me and reading the written exchanges between Harris and Crowley while the deck was in the creation phase was fascinating to me. Right now, I am fully in awe of the Thoth system and have been obsessed with this study. It was mentioned to me several times that in order to fully understand the Thoth system, you should learn two things: Qabalah and Astrology. So, being the book nerd that I am and always looking for a good excuse to buy more books, I have added two new books to my studies and have one on order! 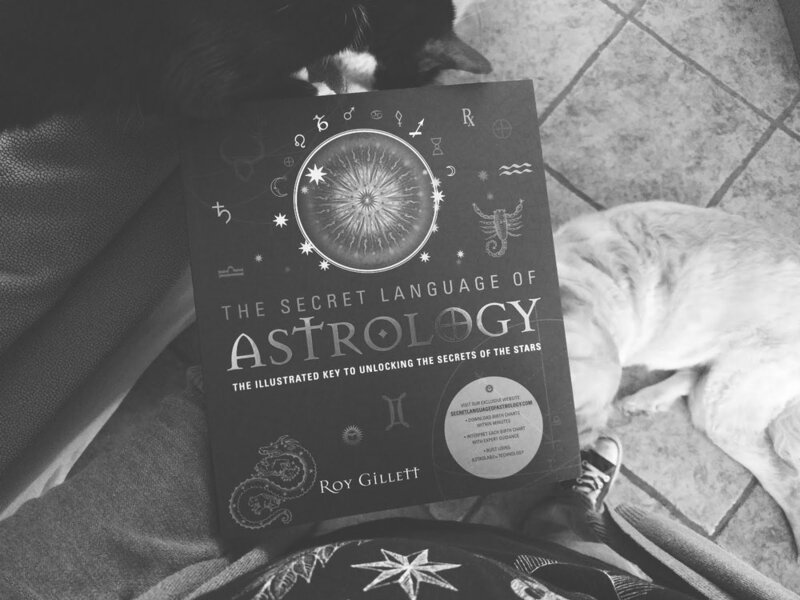 The first one is The Chicken Qabalah by Lon Milo DuQuette (I love his writing and this was recommended several times) and the second book is The Secret Language of Astrology by Roy Gillett (it’s a gorgeous book, also came to me as a recommendation though I have only skimmed the pages so far). The one I have on order is Tarot Correspondences by T. Susan Chang, this will be here later this week and I can’t wait, it was just published on October 8th! While I do know a little astrology, I have to admit that I’m a total newb. I know my moon stuff pretty well, but the rest… ya, I need to start studying! 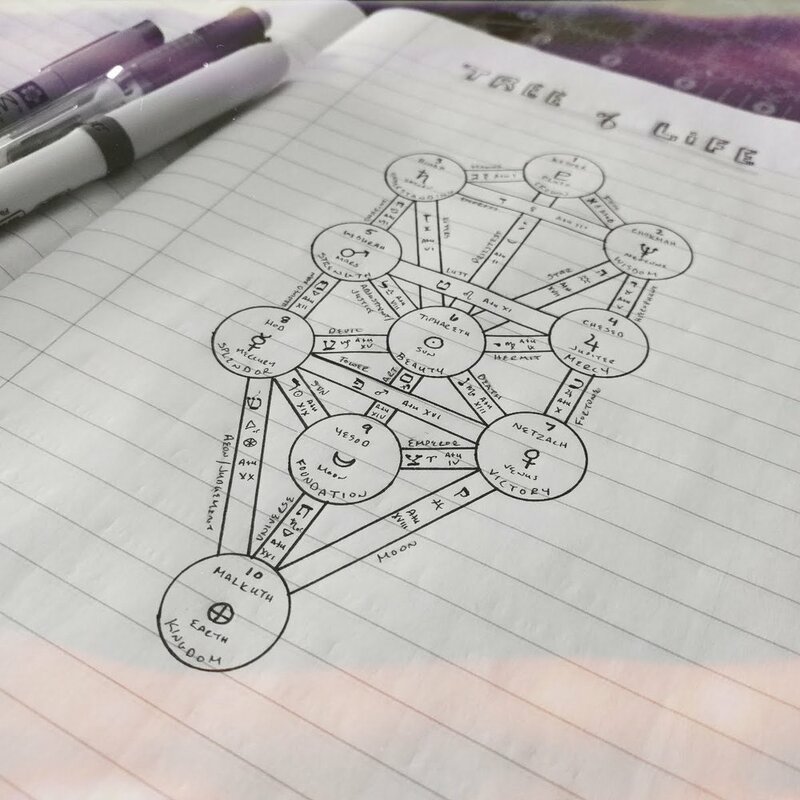 I knew nothing about the Qabalah up until a few weeks ago and I still have so much to learn but it’s starting to make a little more sense to me. I’ve just never been interested so I’ve never looked into it. I’m now so obsessed that I’m dreaming about Sephiroth and the Tree of Life, planetary associations, and the Golden Dawn. There is just so many amazing things layered into the Thoth system, this study really makes my Gemini brain happy! It’s keeping me interested and busy, both of which I like. Thoth has sparked my love for a Goddess that I’ve come across many times but never gave much attention to, Nuit/Nut - the Egyptian Goddess of the Night Sky. I’m madly in love with her mythology and what she represents, reading the words written about her in The Book of the Law (first chapter) was breath taking. As a pantheist, she encompasses my love for the stars. 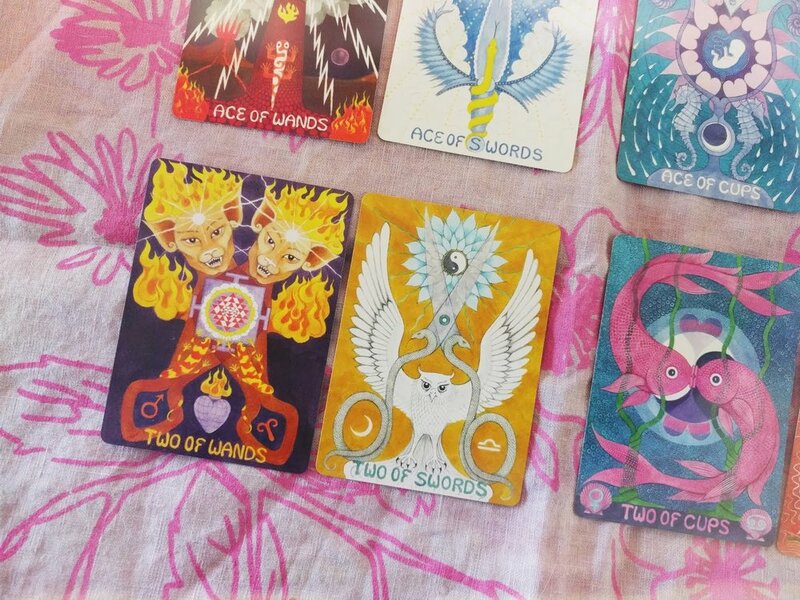 I’ve been getting asked often how I personally started my study with the Thoth tarot and what books + decks I’m working with, so I thought I would mention some things here for those that are interested! Get a journal or notebook! I found it very helpful to draw out the Tree of Life and go add to it little by little as you learn more. Doing this really helped me slow down and follow the paths and get to know where is what on this tree. I refer back to this sketch a lot right now! Also, I recommend that you draw or trace the Rose Cross (this is the design of the back of the Crowley Thoth Tarot). The Rose Cross was really fascinating for me to see how it all goes together, Mr. DuQuette explains it very well in his books and it’s really interesting! In your journal or notebook, make notes as you come across things and be sure to note your resources so you can go back to find them later. I’ve found that drawing diagrams make it easier to process the info given, it’s for sure not a light study but it’s fascinating one! Another tip is to keep a running list of vocabulary! There are a lot of heavy words used in this system and they are confusing if you are new to it all, like myself. If you don’t understand what a word or name is, research and write it down or note it in your books. Also, check out the podcast and Patreon Fortune’s Wheelhouse hosted by MM Meleen and T. Susie Chang. It’s so fun and filled with great info! I’ve barely scratched the surface of the podcast and I’m already hooked, I have already became a Patreon and it’s worth it! I filled 3 pages of notes just on the Fool episode alone, it’s good! They also have a joint Facebook group as well with so many helpful and amazing people in there, I’ve made some new friends and I love seeing the posts from that group show up in my FB feed! I started with the book Understanding Aleister Crowley’s Thoth Tarot and a fresh yellow highlighter… yes, I’m one of “those” people. If you start with this book, I recommend fully that you start from the beginning and work it in order, don’t just jump to the cards. Learning the foundation of the Thoth system really helped me make better sense of the cards themselves. 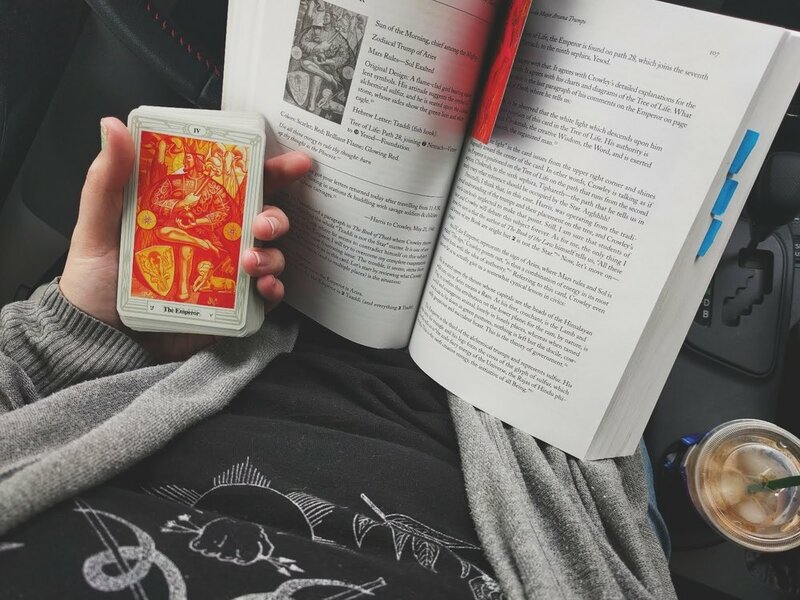 Yes, you can totally just read the Thoth tarot intuitively or even as a RWS deck but I feel like you will be missing out on so much if you do that. There is just so much depth to be found and discovered, it’s added some fresh new layers to my RWS based decks as well. What about, The book of ThotH? You might have noticed that I didn’t mention The Book of Thoth, Crowley’s own book behind the Thoth tarot. In fact, I will be reading Crowley’s book next! I really wanted a good clear understanding of the Thoth tarot from the start since sometimes things just don’t click easy for me. I didn’t want to get confused and end up push this study aside or abandoning it all together, I do that too often with other things. I’ve heard The Book of Thoth can be a deep read but reading Lon Milo DuQuette’s book first helps break the ice a bit and allows for an easier understanding of The Book of Thoth. I’m actually pretty excited to read Crowley’s book! Ok, I think that is all the info I have to share… for now. Though I could ramble all day on the Thoth system and what I’m learning. I may do a second post down the road as I deepen this study or get more questions from others. I will stress that I’m writing about Thoth from a totally beginner perspective, so take that as you will. If anyone has any questions to ask, please let me know in the comments and perhaps I can use them for the second post! Do you enjoy my content? You can support my work by buying me a coffee, my habit thanks you!